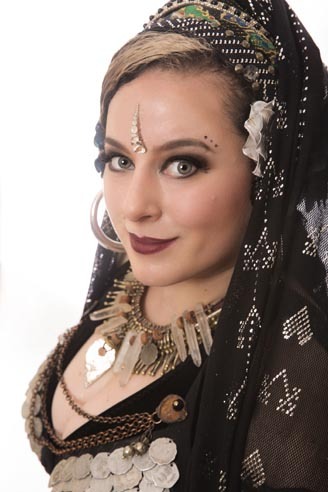 Jesse’s love affair with ATS® began when she saw her first FatChanceBellyDance® performance in 2002. She fell in love instantly with the graceful display of feminine strength. Upon moving to London in 2005, Jesse was determined to foster and shape the UK’s burgeoning ATS® community. As co-founder of Moirai Tribal with Philippa Moirai, Jesse performed ATS® and hosted dance events throughout the UK. She continued to seek every opportunity to study with Carolena and FCBD®, and received her Teacher Training certification in 2008. In 2012, Jesse relocated to the San Francisco Bay Area. She feels incredibly lucky to study and teach at the FCBD® studio, and performs with Tessera Tribal, an FCBD® Studio Troupe. As a teacher, she enjoys infusing students with confidence and a sense of accomplishment. She loves building the dance community and forming connections with fellow dancers.